..but you can get Quality Street. A point made by one of the speakers at the excellent English UK Marketing Conference in London yesterday. 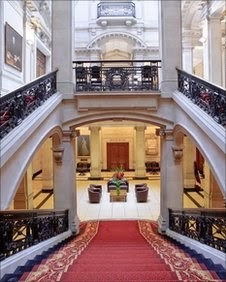 The setting was impressive - One St George Street - just down the road from The Houses of Parliament: see photos. We've been running our residential summer courses for over 25 years now and we've learnt a thing or two about marketing along the way. All the same, it's good to be reminded about what we do well and where we can do better, particularly with regard to the new social technologies. Star speakers were John Hefferman on Google Hummingbird and Geoff Ramm on 'Celebrity Service'. I also enjoyed Patricia Seabright's nuts and bolts talk on marketing basics. A great day and lots learnt in inspiring surroundings. Thank you English UK!